ISDN PRI E1 /T1 Recording Appliances or Call Recording Software brings the amazing facility to record & live monitoring of your calls. 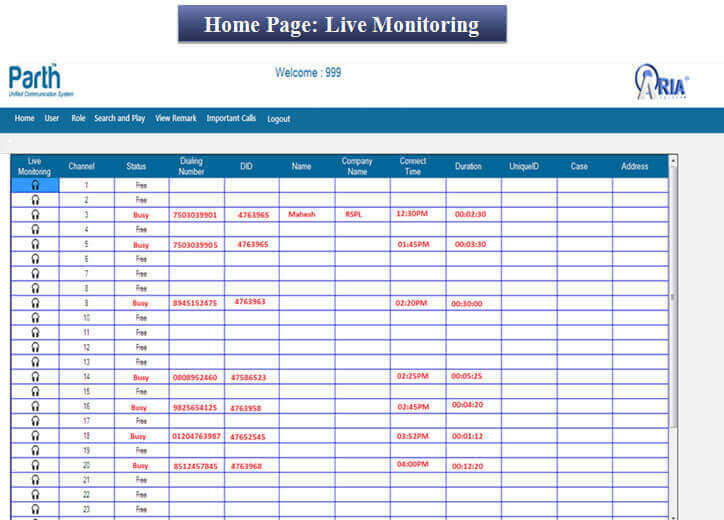 It allows complete tracking of all calls made through your call Centre system. Aria Call Recording Software let you search calls, live monitoring &listen to recordingsand more. This software has been designed to attain highest ease of use and requires minimum maintenance. 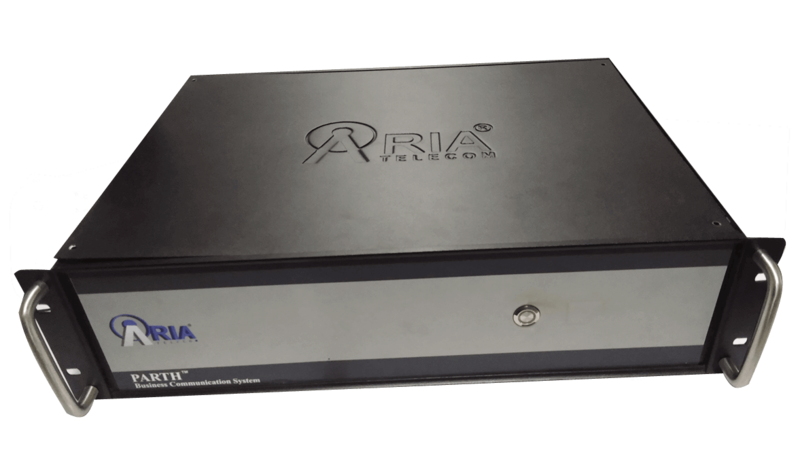 With Aria Call Recording Software let you record multiple phone lines over T1/E1, VoIP, PBX, Analog, and ISDN lines. This telephone recording system can be expand as per your needs. This Call Recording Software offers both inbound and outbound call recording facilities. It offers pausing and resuming of calls as needed within the Aria Telecom interface. All recorded calls are automatically stored in the activity feed of the associated customer for further references. It enables easy, and anytime analysis of the call content which can be helpful for you to understand each calls better. In this way, Aria Call Recording Software ensure a higher quality standards that meet actionable business intelligence. Aria Call Recording Software record both inbound calls and outbound calls. However, it offers extreme customisation that allow you to change call recording settings any time. It allows resuming and pausing of live calls recording within the aria interface. All the features of this telephone recording system can be activated or disabled with a single click. This amazingly designed telephone recording system help you understand your customers better and comply with business regulatory guidelines. These flexible features of Aria Call Recording Software enables prioritization of calls for you. Automatically records the incoming/outgoing calls routed from PRI and VoIP lines. You can schedule the logging duration for trunk and extension lines, and restrict recording of certain phone calls e.g. personal calls. Easy-to-use browser & desktop based application accessible from any remote computer with extensive call reviewing options. Listen to active calls and get in-depth details about all recorded call from the secure interface with authentication. Multiple users can login to the application interface at different access levels with different level rights. Groups can be created for call monitoring and calls can be assigned to each user-defined group. Application interface comprises of advanced search option to retrieve call details & play files on the basis of the given criteria. Perform an advanced search that lets you find the desired details within few moments. 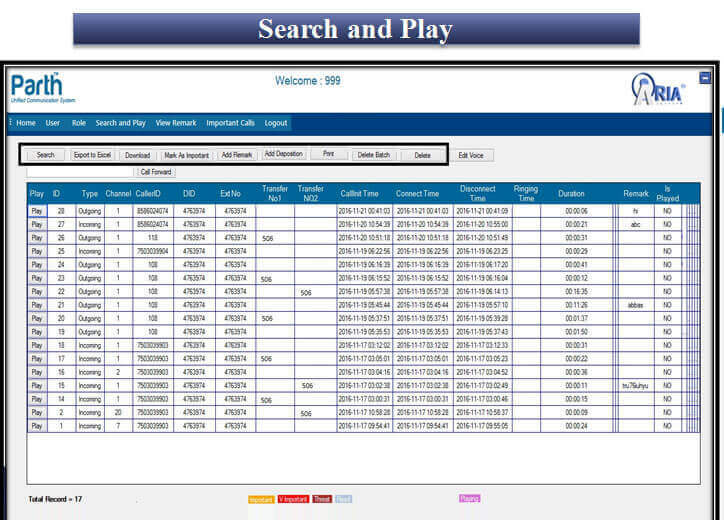 There are multiple Voice files can be converted to advanced formats like GSM/MP3/PCM/G.711 A-law/µ-law etc. to save disk space. Compressed audio file can be exported to another user via e-mail for sharing data. Store all call detail information in MY SQL data base, Call details comprises of Caller/Called ID, Date, Time, Duration and many other details in the form of reports which can be printed out as and when required. Complete calls can be monitored on LAN network through UI application though all the data is stored in appliance for further access as historical reporting. Client information can be available on executive pc through client application. Listen to conversations, select and analyse the recorded audio file with various filters. Aria Parth Voice Logger has option to take the backup of calls to anywhere in ftp folder automatically to secure data. Aria has utility to store all locations data in centralised server for security & analysis purpose. Head office do not depend on branches or franchise to send them data for analysis. Client can maintain phonebook in the system for better recognition of contacts. As all business happens on telephone in call Centres, so proof of calls conversation is very important there. Agent needs to provide accurate & quality information to client; a single mistake can cause inevitable damage to call Centre business. In order to maintain the quality of your process, it is more important that the call Centre executive or agent should be aware of phone etiquette and manners other than the subject knowledge of the process. Also, to retain the existing customers, it requires companies to focus on special practices that attract clients to continue relation with you. Therefore, to minimize the risk of any disconnect in agreement with clients while having conversation with customer care agents it is important to use Aria Voice Logger. It is also recommended by TRAI to use Voice Logger for all call Centres. RBI make it mandatory for all financial transaction conversation to use Voice Logger. Call recording plays a vital role in banks, stock markets, foreign exchange markets, real estate markets, insurance companies etc. Wherever the transactions in the financial offices are carried out over phone, a small mistake of single word can change the complete game. When any dispute arises, these recordings play a vital role as it provides option to the company to refer call recording in case it is required. It helps ro resolve the disputes. Telephone call recording in banks, financial companies, insurance companies & there authorized agents is mandatory function. Aria Parth Voice Logger provide them stable & secure platform to record telephonic conversation with extensive features. Since Aria Voice Logger is originally design & developed by Aria Telecom R&D team, its provide flexibility to customize & integrate further with your existing CRM/ERP. In share trading business, most of the dealing happens over phone. False communication or any error in communication can result in huge loss, to assure safe and secure dealings – recording of all telephone transactions related to share trading are been mandatory by SEBI. Aria Voice Logger provide many important features for specifically for share brokers industry like transferring all voice file to head office automatically & monitoring all branches/Franchises activities sitting in HO. Telephone call recording in police control room, Ambulance help line, Women & children help line, legal offices etc. can be implemented for public security & quality measures. Each call can be automatically recorded with telephone number time date etc. for future investigation in delay of services or miscommunication, as these services are very sensitive & used in emergency. Timing is very important factor in reaching of ambulance & fire brigade to it destination, so little carelessness can cause major disaster. So, Aria Voice Logger play important role & help government to provide quality & transparent services to its citizens. Telephone Call recording is essential in hospitals, clinics, pharmaceuticals & tele medicine centres etc. When doctor dictates the medicine over phone; it is always preferable to record the details. There may arise circumstances when the recording has to be verified for safety purposes. Even call recording in pharmacy can be utilised as a precautionary measure. In clinics, consultation appointments over phone can be recorded which can be cross-verified at any later time in case of discrepancies. Work efficiency & accuracy in Help Lines related to railways, airways, waterways can be enhanced with the implementation of call recording solutions. Recording telephonic conversation between customers and support staff are essential for monitoring insight into agent performance and customer satisfaction. Even the tele conversation between multi offices can be recorded for future verifications. Telephone call recording can also be implemented in shipping, offices like courier firms, cargo and logistic departments where most of the interaction with the customers for the pick-up and delivery of shipments take place over phone. Aria Voice Logger help the clients to improve quality of services. In business& corporates recording all transactions that are dealt over phone with clients to ensure perfect customer service. Regular monitoring and assessment improve service quality resulting in increased customer satisfaction. It helps to maintain the quality of services to clients using Aria voice logger for corporates & offices. The support personnel or help desk executive in Inquiry offices should attend all the incoming calls in a polite and friendly manner with efficient information of the process. To keep the quality checks on calls are weather executives dealt properly and the caller is satisfied with the response from the customer service, Aria call monitoring and recording solutions can be implemented for interaction verification. It will also help to maintain the call report of one particular executive. Airport operation is very sensitive matter, even small error can invite bigger danger. There are lot of enquires on airport regarding flight arrival & departure, which need to be recorded for quality & accuracy purpose. There is lot conversation happen between two airports, which need to be recorded to avoid any error. Aria Voice Logger can also be used to record communication between pilot & ground control room. Even airport staff. Editing of voice file, removing noise etc. Using Aria Voice Logger Client can control quality of the process & monitored on a regular basis to enhance the performance of the employees& process. Regular monitoring of live and historical calls not benefit the client to filter the most productive staff for appraisal but it helps the employees to enhance the communication skill. All clients are important whether they are companies or individuals. They are important for your organisation growth. Unsatisfied clients will not continue to do business with the companies from whom they are buying. To maintain a healthy relationship with the clients we need to provide excellent support service. Recording of telephone calls and interaction analysis helps to ensure the best possible services to the clients. Daily analysis of recorded data over phone reduces spoken errors and improves performance thus resulting in complete customer satisfaction. Recording of the telephone conversation can be priceless whenever there is dispute on deal offered on telephone in your business. The recorded conversations act as an important proof to solve the differences and retain the respect of your customers. The Executive in your organisation is aware of the call monitoring process taking place at the back-end. This makes the staff to be more cautious while talking to the customer over phone. The support personnel will adhere to company policies and regulations, and thus there will be less chance of spoken errors. Using of Voice Logger in business to record all telephone conversation help to improve the quality of process & enhance the customer satisfaction. If you clients are satisfied you are getting repeated business from your clients, nobody can stop the organisation to grow. There are chances that your staff while answering the calls may commit speech errors. The staff can hear their own voice conversations with the customer to avoid mistakes and improve call etiquette. And it will help them to improve. In many processes like call Centre, telemarketing, financials, hotel, share broking and in many more business there are law of mandatory recording of telephone recording. So use of voice logger is mandatory. Sometimes investigating agencies anti-terrorist squad etc. record telephone of some suspects & targets to trap them & know their activities. So, Aria Voice Logger help them recording of telephone calls, SMS etc. & alert them in case it is required. PARTH 30R is a solution for the call Centre which can run 30 agents at one go . This product supports the simultaneous recording of all the 30 channels. It is directly connected with the ISDN PRI and has the easy installation steps. It has a user friendly interface for monitoring and filteration of recordings purpose. PARTH 60R is a solution for the call Centre which can run 60 agents at one go. This product supports the simultaneous recording of all the 60 channels. It is directly connected with the ISDN PRI and has the easy installation steps. It has a user friendly interface for monitoring and filteration of recordings purpose. PARTH 90R is a solution for the call Centre which can run 90 agents at one go. This product supports the simultaneous recording of all the 90 channels. It is directly connected with the ISDN PRI and has the easy installation steps. It has a user friendly interface for monitoring and filteration of recordings purpose. PARTH 120R is a solution for the call Centre which can run 120 agents at one go. This product supports the simultaneous recording of all the 120 channels. It is directly connected with the ISDN PRI and has the easy installation steps. It has a user friendly interface for monitoring and filtration of recordings purpose. Q1)	What is ISDN PRI Logger? It is a telephone voice recording system which helps to record the digital line/PRI line.it helps to evaluating the caller’s performance by listening recording files. Q2) What operating system requires setup voice recording system? It is an asterisk based solution & works on OS Centos 6.8. Along with the OS we need to install the compatible software packages & drivers to make run system successfully. Q3)	Can we record multiple PRI lines at a same time? Yes, we can plug-in the multiple lines in one PRI card as it is available in terms of 1,2, 4 port & so on. Q4)	What Operating system requires hosting User Interface application? It’s a window based application and need a window PC to be hosted. Q5) Why I am unable to login into user interface? Here two reasons can be exist either the permission is not provided to window system IP address via access through Recording server or due to available antivirus user is not able to login into application. Q6)	Why CLI is not coming in MIS Reports? Sometimes CLI is blocked through service provider so it can be enable by asking them or might be we are picking the phone early and getting CLI after 3-4 rings. Q7) Is this Recording Machine can be connected with available hard EPBX? Yes it can be possible, one direct line will be inserting into PRI Recording Machine and outcome will be going into EP-PBX then further lines will be distributed in terms of extensions. Q8) Is this system support to Extension to Extension Recordings? a. It’s easy to record the extensions if single recording machine is utilizing. Note: When you will dial another extension; the call should be route via recording system firstthen further proceed via EPBX. Q9) Why I am Unable to Host the user interface? System should consist IIS Manager (Internet Information Services) to be installed in it. Q10) Can we restrict the users to view logs of others? Yes it is possible; Feature is available of Assign functions to role/userafter thatuser will be able to view or utilize the functions only which was assigned by admin. Q11) How can I download the recordings? 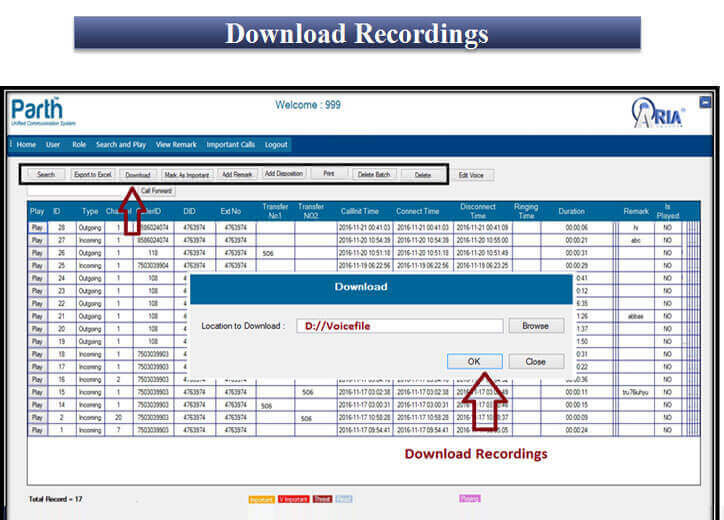 Provision is available in User interface to Play/Download the recordings.it can be individually download or batch wise. Q12) Why Red Light/Green Light appears when inserting the PRI? Red Light Indicates: Either PRI is down or compatible software is not installed to configure the PRI line. Green Light Indicates: PRI is Up or successfully configured with the system.